Labor, delivery, and our sick and sorry Church. I didn’t think the unraveling of the Catholic Church and the birth of my son would have any correlation with one another, until a woman brought me Jesus as I sat on my hospital bed the day after my son was born. Motherhood, a natural eucharist. This, the reality of pregnancy, the reality of motherhood, the reality of bringing a baby into the world...a woman says to the life that comes from within her, “This is my body, given up for you.” I sat at the pool, filled to the brim with a nine-pound baby, as uncomfortable as I’ve ever been, and reflected on these words and what it means to give up your body for another. And a few long weeks later, I went into labor. My labor lasted for well over a day, and was a very long and challenging journey. Throughout the entirety of my labor, I recalled and repeated those words that pierced my heart at the pool to my son in my heart again and again...my son, this is my body, given up for you. 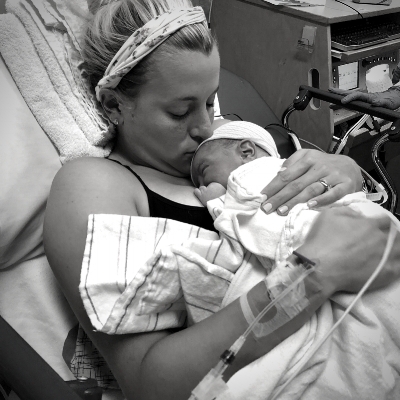 In the end, my body did not want to give birth, so with the care and wisdom of my doctors I ended up in the operating room so my son could be birthed safely. They spread my arms wide on the operating table, and as my weary body shook and kept shaking, I whispered to my son in our oneness, once again...this is my body, given up for you. The doctor proceeded to pierce my body so my son could have life outside my womb, and on November 3rd, his cry reached my ears for the first time. It was, indeed, one of the most majestic moments of my life. And, strange though the correlation may be, I thought of all the anger, frustration, and sadness I had experienced in the few months before that moment with the incessant revelations of how sick and broken my Church is. When the Church started unraveling in August with the appalling, mind-boggling news of abuse uncovered in Pennsylvania, I was sickened to my core along with countless professed Catholics all over the world. I continue to be. And it all continues to get worse. There are evil men in my Church who have abused their power at the expense of thousands of innocent people whose lives are forever altered by such abuse, and very few men who have the power to do anything about it seem to care at all. There are spineless cowards in my Church who have covered for these monsters and done absolutely nothing to protect the vulnerable except turn a blind eye and pretend to be exhibiting “leadership.” Any person with a brain would wonder why anyone would stay when the continued cover-ups of abuse and corruption go so deep and wide it is unfathomable. But on that Sunday in the hospital, as I sat on my bed with my baby in a clear box on wheels next to me, and this woman held up the Eucharist, I received His body, given up for me. Those words I had spoken to my baby so many times the day before this Eucharist...they are the reason I stay. Every time the priest holds up the Eucharist and says those same words Jesus Christ proclaimed at a shoddy table filled with shabby fishermen during that Last Supper…”Take and eat, this is my body, given for you,” I remember Christ’s sacrifice of His body for me on Good Friday...his crown of thorns, his bloody, beaten back, his hands nailed through on a splintered cross, his last breath given up on Calvary, for me. And I now understand just a minute fraction of what it means to give your body up for another in a brand new way. A few days later I was brought home to recover, my body sewn up and changed forever for our boy. And I have told him, out loud, as he lays in his bassinet and I look at my body in the mirror, that appropriately looks like it has been through a battle...Still and always, this is my body given up for you - and my dear sweet son, how I would do it again and again, one million times over. And in the Eucharist, I meet and receive Jesus Christ, whose sacrifice for me has nothing - absolutely nothing - to do with the behavior of the gutless excuses for men who have infested a Church that will, come what may, forever be a part of me. This is my body, given up - and my dear sweet daughter, how I would do it again and again, one million times over...for you.